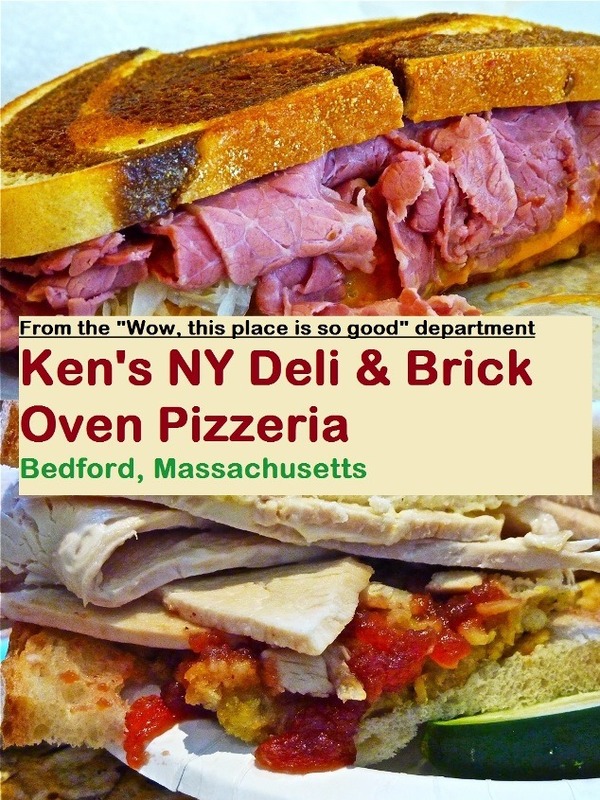 Local Dining Out Gem: Ken's NY Deli & Brick Oven Pizzeria in Bedford, Mass. Ken's: a cornerstone business in the downtown Bedford district. Nothing turns out as expected when dining out at Ken's NY Deli & Brick Oven Pizzeria in Bedford, Mass., and that's a good thing. First, Ken's bears absolutely no resemblance to some hometown family-style restaurants that often feature worn carpets, food and service. Ken's has no relation to the typical pizza houses, either, with their "10 minutes, please" pre-made pizzas and bustling but charmless, cramped dining spaces. Additionally, Ken's could serve as the poster child for effective use of miraculous cleaning products that actually work -- the place is continuously spotless, inside and out. 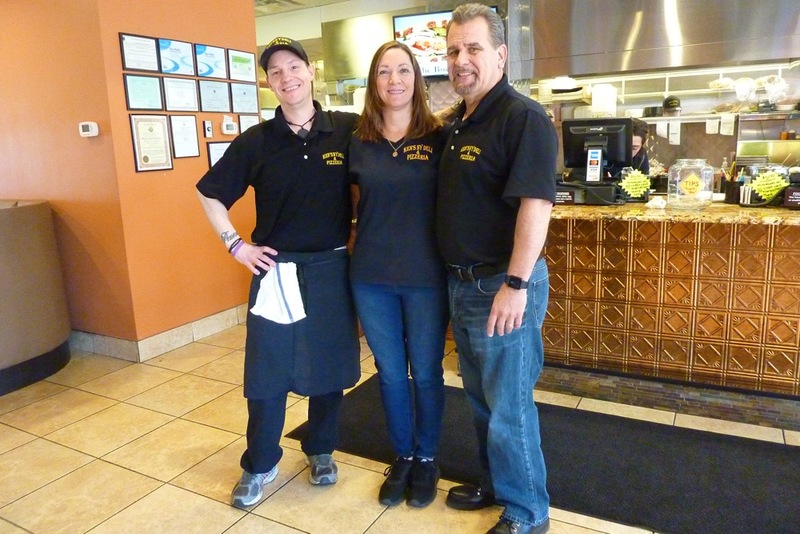 Ken's NY Deli & Brick Oven Pizzeria Owner John Cronin, wife Maria and a staff that has seen little turnover since the beginning have created a rarity in suburban Boston family-friendly dining. They take the best elements of several restaurant genres and often exceed what they do. As a true testament to Ken's commitment to excellence, the tasty, affordable sandwiches are piled-high instead of piled high and deep with overpriced attitude. Reuben sandwich from Ken's in Bedford. 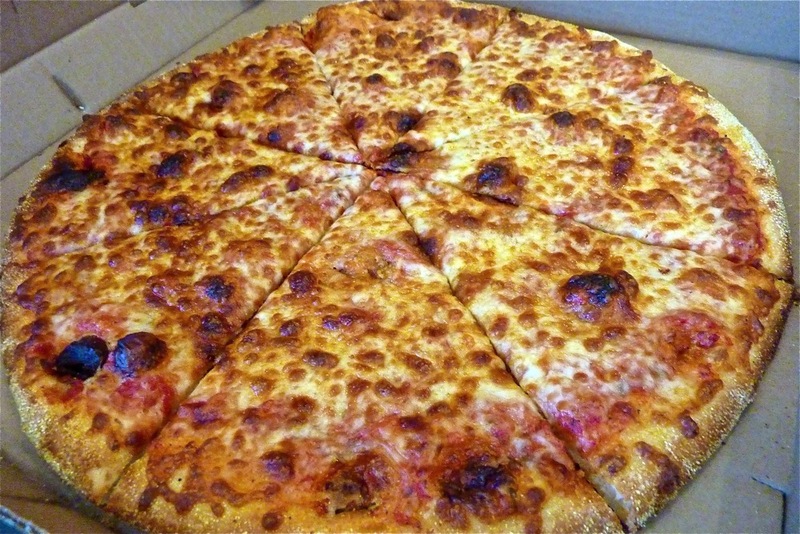 The pizzas have that extra-dimension usually reserved for the most highly regarded pizza joints in Boston. The correct balance of flavorful tomato and cheese, spices and toppings result in an offering that tastes like something between Regina Pizzeria and Santarpio's, both landmark pizza places. The homemade soups evoke something like out of grandma's old-fashioned kitchen, the chowder and bisque like that from the top echelon coastal seafood restaurants. As a result, Ken's has become a household name in Bedford with some customers arriving at this pleasant eatery four or five times a week. "They like the variety on the menu, the fresh food and welcoming staff and atmosphere," said John with a genuine humbleness. 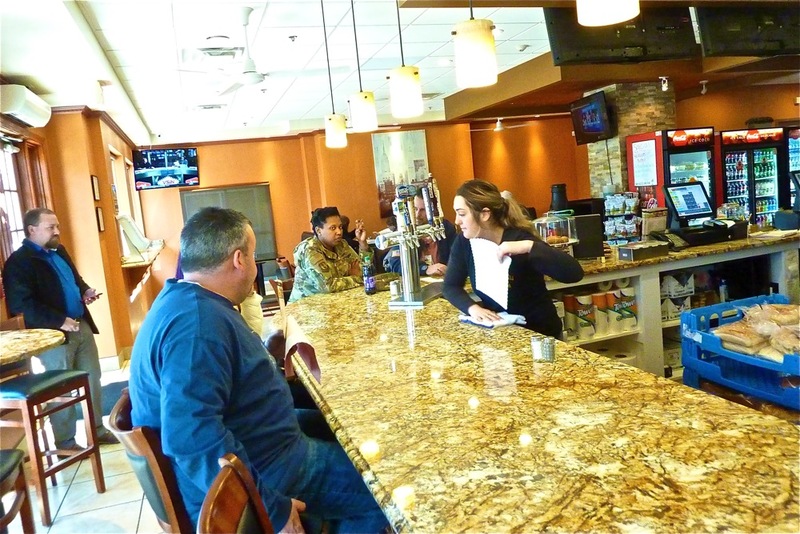 Erin Fitzgerald cleans the counter before taking orders from local residents and soldiers from Hanscom Air Force Base. Ken's NY Deli & Brick Oven Pizzeria was first located at the former, under appreciated Middlesex Mall in Burlington, Mass. - also known as the Caldor Mall (where Market Basket is now located). Ken's later moved to its current downtown Bedford location with the original owner eventually selling to Cronin in 2013. John decided to keep the locally well-known restaurant name intact but also made up his mind to take the dining spot to another level. At first, the evolution of the Ken's NY Deli & Brick Oven Pizzeria involved some trial and error. John has a degree in electrical engineering from Wentworth Institute of Technology in Boston, Mass., and worked in the construction business for 30 years. Maria was employed in retail for many years. The initial learning curve in operating a restaurant often provided a challenge. The Cronins, fortunately, became quick studies of the industry while having a true ace-in-the-hole: Head chef and part owner Billy Silva, a culinary whiz from north of Boston with a significant background in the restaurant industry. Silva can cook in many different styles quickly and efficiently with high quality results delivered to a customer's table. "There were struggles early on but we figured it out," said John. "We were tired of our old jobs and really wanted to do this. Looking back, I am glad we did." 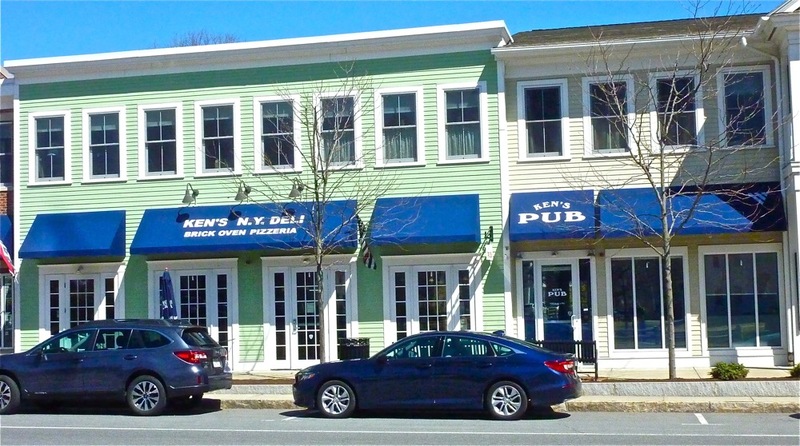 The Cronins also opened Ken's Pub not too long ago (replacing a frozen yogurt shop). 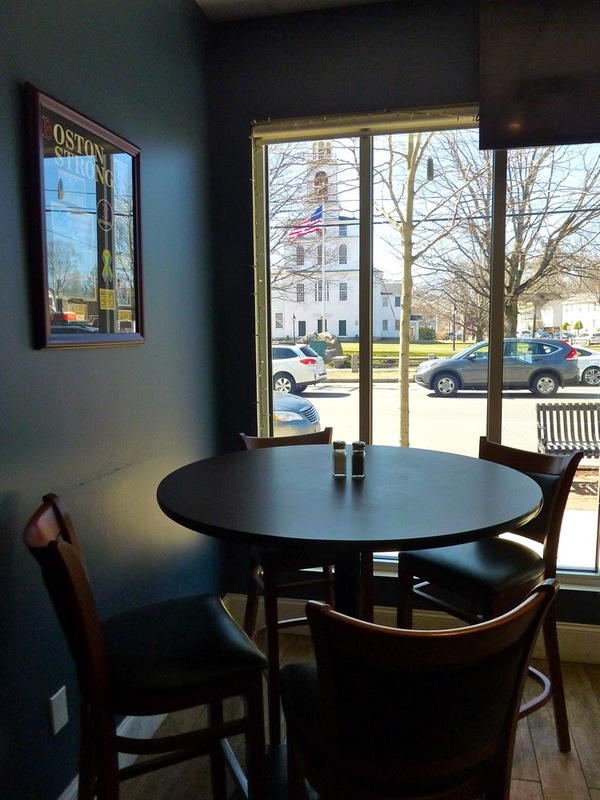 It's a cozy and comfortable dining spot connected to, but separated from Ken's NY Deli & Brick Oven Pizzeria. Ken's Pub offers some very nice dinners featuring steak and pasta specials, as well as drinks including a well chosen variety of wines and beer on tap. Ken's Pub's hours are from 4 p..m. to closing time (can vary), while Ken's Deli and Brick Oven Pizzeria is open from 10 a.m.- 9 p.m. Monday through Saturday and noon to 8 p.m. on Sunday. "More families are at Ken's, more adults at Ken's Pub," said John. 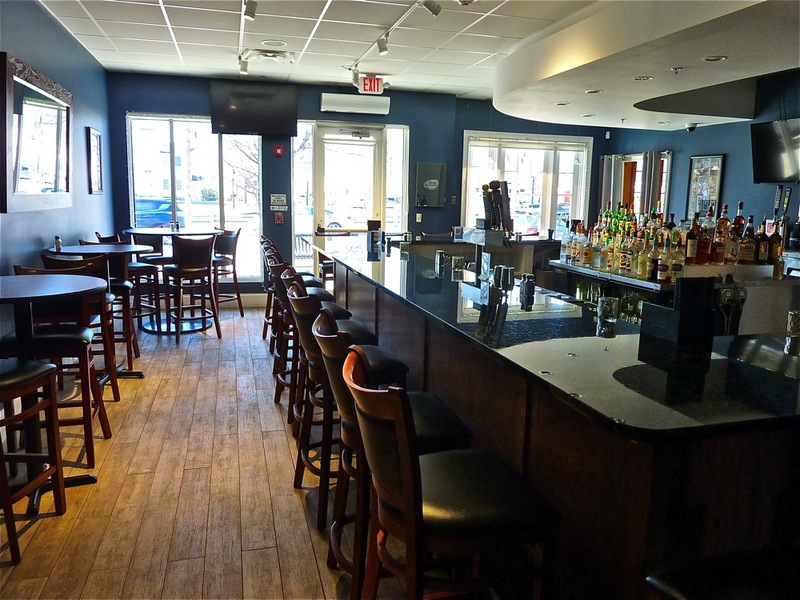 "It turned out to be a good move opening Ken's Pub." Lively scene in the main dining room at Ken's. Photo credit: Ken's NY Deli and Brick Oven Pizzeria. On a brisk, windy spring New England day, a man cleans every inch of every window in front of Ken's, helping it look like a welcoming hometown restaurant you'd see featured on a local or national food TV show. The outdoor dining tables have come back from hibernation to create a leisurely dining space that seems like a perfect fit for those warm spring, summer and fall days. The blue awning with white lettering against a light green-painted exterior suggest a classic downtown eatery. Welcoming outside scene at Ken's. Photo credit: Ken's NY Deli and Brick Oven Pizzeria. Inside, Ken's delivers on that exterior promise featuring a spacious dining room with a pleasant informality, an open kitchen concept, beer on tap at the counter, televisions on the walls and lines of locals. Busy time at lunch. Photo credit: Ken's NY Deli and Brick Oven Pizzeria. By noon on this day, Ken's becomes packed with local residents, corporate workers, and government employees and military personnel from Hanscom Air Force Base and the Bedford VA. The order takers, chef and cooks can barely keep up with the orders, but somehow manage to do so without losing any connection with their customers. The grill and conversations simultaneously sizzle at the same time. 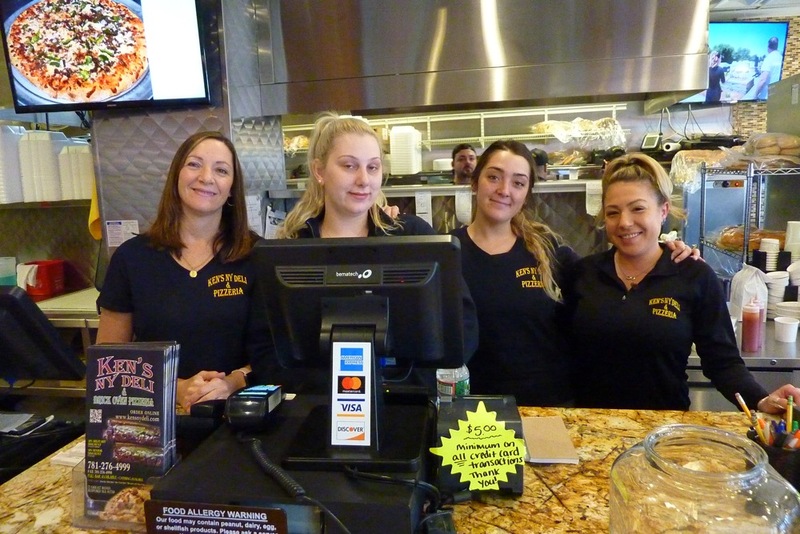 Maria and employees Jamie Hersey Erin Fitzgerald and Krystal Silva (yes, Billy's sister) communicate and get along with each other like a close family. Maria comes across like a warm, supportive mother who can also give direction well. John walks around the restaurant with a civil nature toward his employees, but also a quiet intensity that focuses on running a tight operation. Billy is glued to the kitchen as if it was his last day cooking. He puts a tremendous effort into this craft, but along with his cooks never forgets to be social. "The open kitchen concept is great," said John. 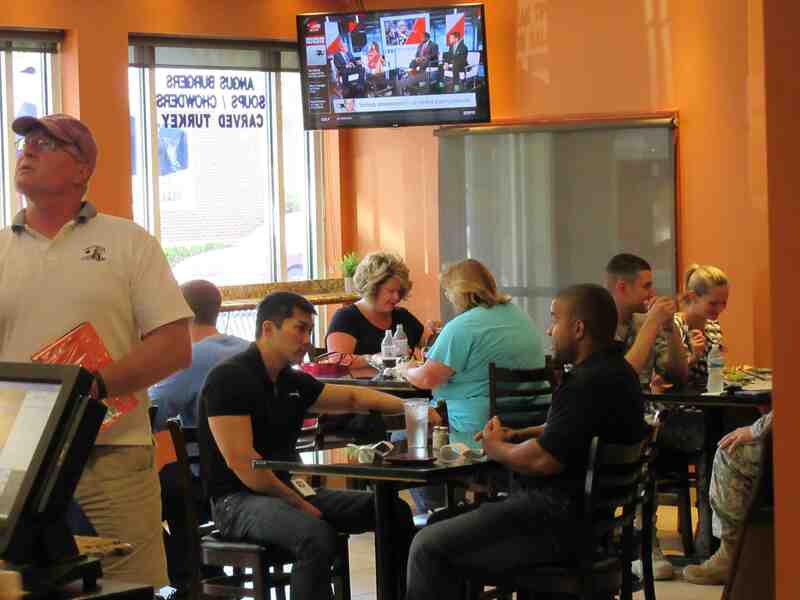 "The cooks can interact with the customers and front end staff. It's a friendly environment here. The kitchen is part of the restaurant instead of being separated from the customers." Appreciating cooking and conversation at Ken's. The tin-like counter, tile floors, white ceiling fans and orange walls provide an inviting setting that helps make Ken's NY Deli & Brick Oven Pizzeria a welcoming place. The owners and employees, however, ultimately create the dominant welcoming vibe. Many employees like front end manager Jamie Hersey have worked at Ken's since John took over the restaurant. Locals love Jamie's strong work ethic, efficiency and friendliness -- all hallmarks of a stellar restaurant employee. Jamie Hersey meets with customers. "Jamie remembers everyone," said John, 54. "Even if she hasn't seen you in a month." 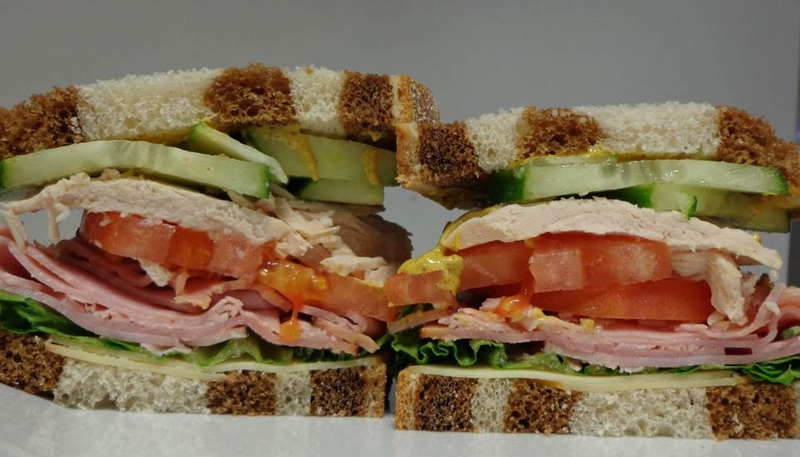 The Buccaneer: thinly sliced Virginia ham, oven roasted turkey, smoked Gouda cheese, lettuce, tomato, cucumbers and Dijon mustard, Photo credit: Ken's NY Deli & Brick Oven Pizzeria. Consistency in a restaurant is a good thing, but not when the food is consistently terrible, or at best, mediocre. Fortunately, Ken's takes the extra steps to avoid being just another uninspiring place to eat. "The size of the menu is large," said John, a Lynn, Mass., native. "People can get sick of having the same old stuff. We have subs, sandwiches, wraps, platters, pasta, soups, salads. We just make sure to do them all really well." The proof is ultimately in the product, however, not the words. Ken's NY Deli and Brick Oven Pizzeria definitely delivers on its promise. If you are suspicious of, or can't stand slimy, thinly cut deli-style turkey, Ken's stays away from that all too familiar "fowl" offering (sorry for the bad pun). Ken's actually cooks its own turkey and serves it in thick slices, reminiscent of the Thanksgiving version. 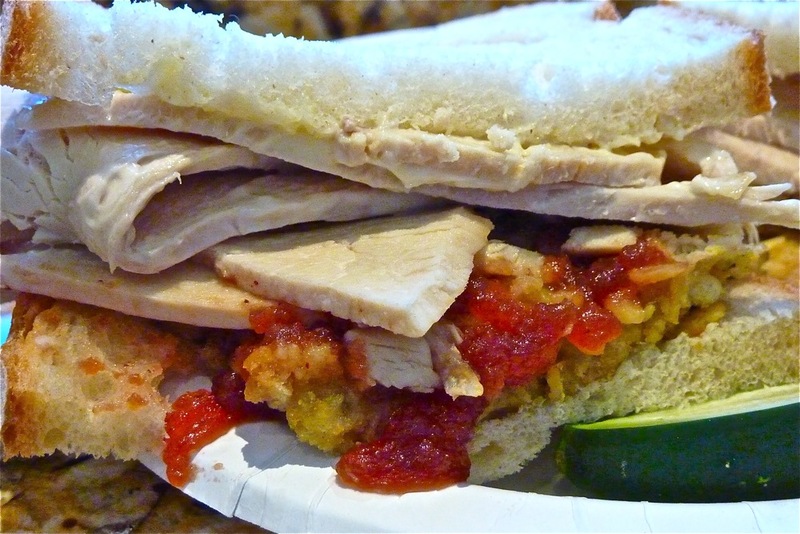 Highly recommended: the Plymouth Rock with oven roasted turkey, stuffing, cranberry sauce and mayo. 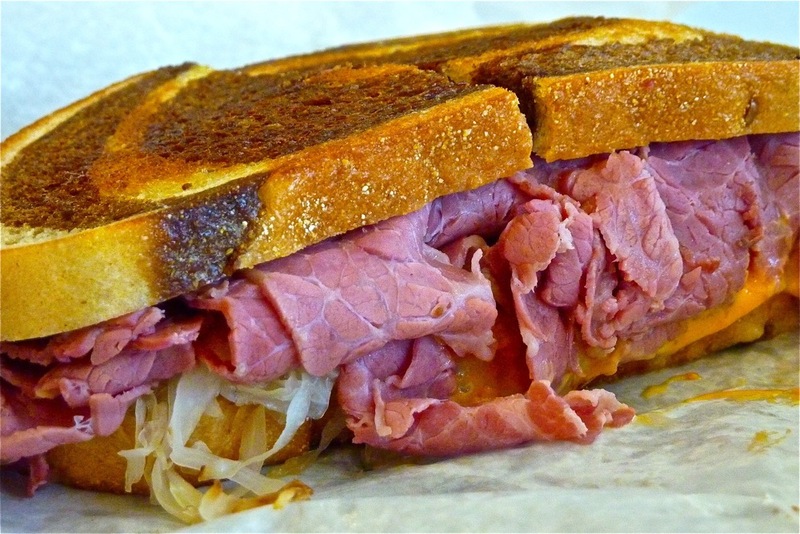 Ken's also cooks its own corned beef, roast beef and pastrami every day. The pastrami, by the way, is the preferred New York-style black version -- heavy on ground coriander, mustard seed, garlic and onion. This writer has tasted real New York pastrami and Ken's version is every bit as good. Ken's takes several hours to prepare the pastrami to keep the juices in and maximize the overall taste unlike many other restaurants that sell more of an "instant" kind. "Everything we buy and make are of high quality," said John. "Our meats have no nitrates. We make our own meatballs, bread our own chicken. We don't take shortcuts. Yes, we do have to make money, but we will not skimp on anything. We never want a customer to leave disappointed." Menu favorites include the pastrami and roast beef, a Reuben that is to die for, homemade chicken salad, and a chicken kabob sandwich. 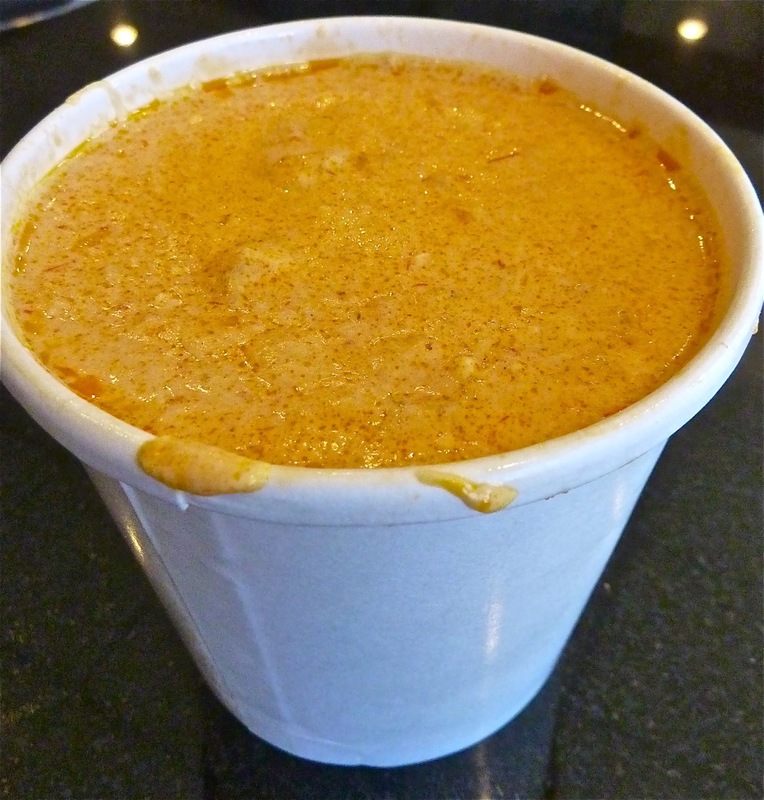 The lobster bisque special is absolutely delicious with a real hearty lobster taste. For the full Ken's menu, click here. Pizza also stands as a popular item and rightfully so. Ken's wisely doesn't try to do too much with the pizza. They use high-quality mozzarella cheese, make their own homemade sauce and cook the pies at a modest 550 degrees. Yes, many high-end pizza places brag about cooking at, say, 750 or 900 degrees, but sometimes that's nothing more than a lot of hot air not always translating to good pizza. The Cronins, chef and staff know that what they do with the pizza ingredients is most important. Most people just want the right balance of cheese and tomato, seasonings and lots of toppings. Ken's NY Deli & Brick Oven Pizzeria does just that with pizza that would fit right in with the best of the North End establishments in Boston. The fact that you can enjoy a great pizza in suburban Bedford is somewhat stunning and a revelation to locals. Good pizza is somewhat hard to find in the Bedford area. Ken's also offers mouthwatering calzones including meatball parmigiana, chicken parmigiana, buffalo chicken, imported Italian cold cut (Mortadella, Genoa salami, capicola, provolone), eggplant parmigiana, angus steak and cheese and a steak bomb. Maria, Jamie, Erin and Krystal at Ken's counter. I not only consider Ken's a top choice for locals, but also for those visiting neighboring Lexington and Concord. Ken's is an ideal dining spot, too, for those who love to dine outdoors in the summer and when leaf peeping in the fall. Bedford is a beautiful, historic town with a pleasant small downtown that features a beautiful town common and white church with tall steeple across the street from the attractive renovated building that houses Ken's and other businesses. Lexington and Concord often get the attention for historic homes, but you'll also see a high concentration of them right in Ken's neighborhood. It is a pure, classic New England scene. Quintessential New England scene right across the street from Ken's Pub. Ken's NY Deli & Brick Oven Pizzeria achieves greatness on so many levels. It's really hard to find a comforts food restaurant in the outer suburbs that brings everything good about dining out under one roof. Ken's does that, for starters, as a family owned and operated restaurant. The food rivals that of the best big city delis and pizzerias. Fresh food, big servings, nice food aromas in the restaurant, friendly staff, fast service, reasonable prices, unpretentious pleasant environs -- what more does a restaurant customer need? Kudos to a former construction worker, retail specialist, skilled veteran chef and a wonderfully well-chosen staff that makes Ken's such a fabulous suburban Boston dining choice! 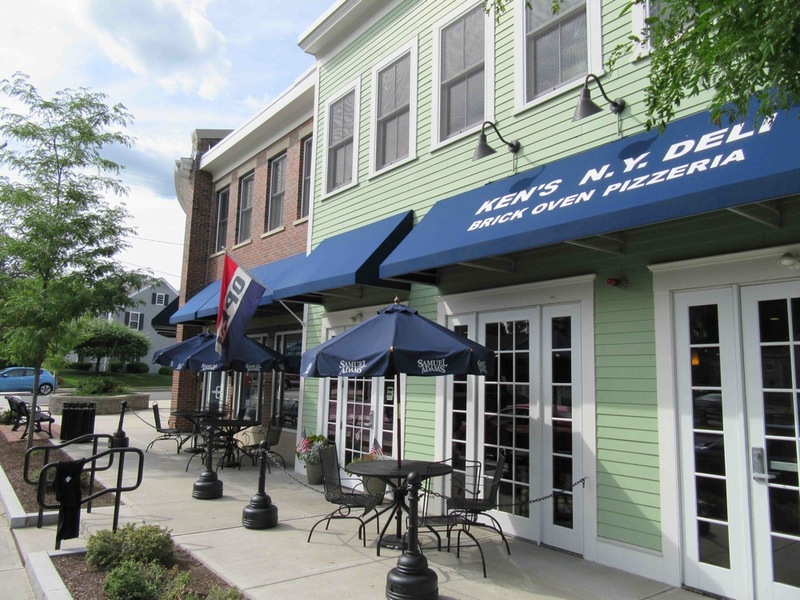 Ken's NY Deli & Brick Oven Pizzeria is located at 72 Great Rd. in Bedford, MA. Tel. 781-276-4999. Hayward's Ice Cream, Nashua, N.H. If you enjoyed this article, please share through any of the social media buttons below -- thanks! 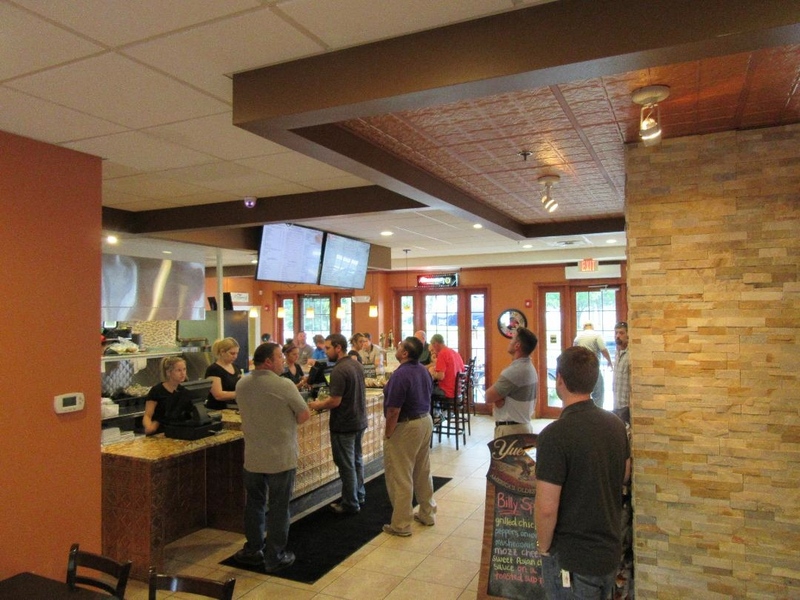 Like this story on Ken's NY Deli and Brick Oven Pizzeria? Share it on Pinterest! Interested in your local business becoming part of our New England community? VisitingNewEngland business partnerships differ than feature articles previously posted on VisitingNewEngland. Businesses pay a small, one-time fee to have pages like this appear, and first must be accepted by VisitingNewEngland.com editor and publisher, Eric Hurwitz, as a business he approves as part of "real New England travel" to keep the integrity of the site. Businesses that sign up for business partnerships receive priority by receiving more social media exposure and link placement on VisitingNewEngland.com. Contact Eric if interested in forming a business partnership. Explore Massachusetts travel! Read the Massachusetts Town Greens book -- Discover New England's first travel attractions: town commons. Includes a chapter on the Plymouth town green! VisitingNewEngland's small business commitment to excellence: VisitingNewEngland.com is a proud, small business based in New England. We love it when one of our articles helps you with your New England vacation and travel trip planning! That's what we are here for: to serve you in the most genuine, helpful way possible. Old-fashioned New England work ethic: All articles, photos by Eric Hurwitz unless otherwise noted. Eric also manages the site's layout and design, social media, and public affairs. All this, and blogs too! Also, please check out our authentic, informative and entertaining New England travel blogs with original content: The Thrifty New England Traveler (New England travel ideas on a budget), The New England Travel and Vacation Gazette (more original New England travel articles), and Old School Boston (warm memories of Boston and New England from back in the day).